In 1998, we found 164 swing seats—districts within 5 points of the national partisan average, with scores between R+5 and D+5 (a score of R+5 means the district’s vote for the Republican presidential nominees was 5 percentage points above the national average). The data 15 years ago showed just 148 solidly Republican districts and 123 solidly Democratic seats. Today, only 90 swing seats remain—a 45 percent decline—while the number of solidly Republican districts has risen to 186 and the count of solidly Democratic districts is up to 159. In 1998, the median Democratic-held district had a PVI score of D+7, and the median Republican-held district had a PVI score of R+7—pretty partisan, but far from monolithic. Today, those median numbers are D+12 and R+10, and that 22-point gulf is the main structural driver of the political paralysis we lament today. President Obama’s second inaugural address was inspiring, the messages of inclusiveness most sweet, but I have to add my voice to the chorus of disappointment. I had a dream the day prior that some truly nonpartisan commitments would pass his lips along the lines of “Let us bind up the nation’s wounds.” With history offering this young president a second chance to carve some immortal words, to take a stand apart from partisans totems, he retreated to the easy path of slogans that sees the world divided into his allies and his small-minded opponents. Who doesn’t reject that? What’s the point, then? Why this empty marker “modern economy?” Did ancient economies not enhance their productivity with roads? Did higher levels of human capital have no benefit in previous times or in non-democratic societies? No and no. But the implication is that government has a provisioning role–one that “we determined”–which is not logically coherent. If anything, there is an emerging recognition that centrally managing transportation and education through the government, insulated from market forces, is inefficient. In the two months that this speech was being drafted, the world famous beltway around DC was introducing new, dynamic toll lanes. The coincidence is almost funny. Meanwhile, public schools are transforming from command-oriented to market-oriented through the relentless expansion of charters and vouchers. Yet in DC, the Obama administration chose to let a very popular voucher program expire, leaving countless poor kids trapped in bad schools. A visionary president would have described the forces in play. We can imagine individualized learning and credentialing that displace industrial-era diploma factories. But no. What does this sentence mean? Rules exist to define what ‘fair play’ is. Ensuring fair play is about enforcement of rules, not rules themselves. What the President seems to want to say is that the liberal orthodoxy of regulation is better than anarchy or what the left calls market fundamentalism. So? Again, who disagrees with that? As a statement here, he is asserting bluntly that more rules mean more fairness. That fails logically, and is disappointingly shallow. Why not a whisper about regulations that choke entrepreneurial dreams of the poorest Americans? Why is risk-taking the privy of well-connected venture capitalists with money for tax and regulatory compliance? His ideas here fail as badly as his words. The President trying to establish a marker that there was (and naturally is) a consensus that the government is the insurer of last resort. Because, we all know, private insurance fails, right? So what will Americans say when death (one of ‘life’s worst hazards’) keeps happening, and at more expense to the dying, in the wake of the federal government’s expansive new role as the health insurer of last resort? As a principle, insurance in this worldview is a blank check. It holds: the damage from any misfortune, especially in this era of man-made climate change, is surely not to be the responsibility of the individual who builds a home on a sandbar, but on his fellow citizens. I appreciate the sleight of hand, to assert that these principles are fundamental liberties, to be found in the best intentions of the Framers. But they not. Liberty means freedom TO do things, not freedom FROM things. I have to admit that Glenn and I were worried that our book would lose almost all of its relevance if the political climate in DC improved. Our prediction is that political compromise is becoming less possible. Woe to book sales if Obama overcame the baser pressures of our times. Well, not to worry for the book’s message — it is more valid today than when we first proposed it. But even more to worry for the country, as we embark on four years of an uncompromising White House. After all, President Eisenhower sent federal troops to my home state to integrate Little Rock Central High and built the interstate highway system. And as governor, I worked with President Reagan on welfare reform and with President George H.W. Bush on national education goals. I am grateful to President George W. Bush for PEPFAR, which is saving the lives of millions of people in poor countries and to both Presidents Bush for the work we’ve done together … I work with Democrats, Republicans and Independents who are focused on solving problems and seizing opportunities, not fighting each other. Unfortunately, as the former President surely was hinting, that kind of bipartisan leadership has been missing from DC during the last four years. See the Politico story today here, for example. Or see the excerpts from Bob Woodward’s Price of Politics here about Obama’s partisan style: “It was increasingly clear that no one was running Washington. That was trouble for everyone, but especially for Obama,” Woodward writes. 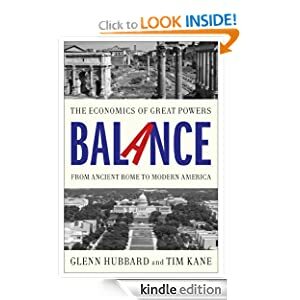 Partisan polarization is a huge danger if it is allowed to continue because it means our nation will simply not be able to address the fiscal imbalance of trillion dollar baseline deficits. The total number of opposition votes Obama attracted for all five signature laws was just 14 in the Senate and 21 in the House. The comparable numbers for Bush are 145 votes in the Senate and 468 in the House. …The Obama White House never sought centrist policy or votes in its signature legislation, not even from centrist Democrats. Consider the 34 Republican representatives who voted against Bush’s NCLB because they thought it too liberal, in contrast with the 33 House Democrats who voted against Obama’s Patient Protection and Affordable Care Act because they found it too liberal. Knee-deep in reading about how other Great Powers have declined, it is clear the extent of polarization could get a lot worse. In the Ottoman empire, the Janissaries morphed from the Sultan’s fearsome elite infantry unit into a self-serving special interest that resisted new technology. They deposed Sultan Selim III in 1807 for trying to modernize the military. The next Sultan, Mahmud II, was careful to slowly consolidate his power and then initiated a fight with his own Janissary Corps, burning 4000 of them to death in their barracks. In Ming China, for example, the eunuchs struggled bitterly against the Confucian Mandarinate for centuries, but the Mandarins ultimately won and not only docked Zheng He’s great treasure fleet after 1436, but also burned records of his travels, and made sure the emperor banned ocean travel. Short-sighted politics to say the least.